This 2.2 Acre hillside estate located in Bonsall offers views to the ocean and beyond; San Clemente Island, Oceanside, Fallbrook, and Vista. This superior built custom home is surrounded by an income producing grove of Haas avocados plus family fruit of Asian pear, apple, peach, plum, apricot, tangerine, orange, lime, lemon, grapefruit, cherry, and fig trees...blueberries, blackberries and boysenberries. The most unique feature of this home is the spectacular 50' x 14'6" attached, heated and air-conditioned Motor Coach Garage, with 16' ceilings and a 14'2" overhead door that will handle the largest luxury Motor Coaches on the road today. Situated in South Bonsall, mailing address in North Vista, it enjoys probably the most ideal climate in the United States. Low humidity, frost free, ocean breezes, ocean views, and absolutely incredible construction. Enter this wonderful home through a beautiful leaded glass and Honduran Mahogany front door into a spacious two story entry with ceramic tile flooring and elegant chandelier. Immediately the quality of this home is apparent. The gorgeous sweeping staircase leads up to the main living area, but before we leave the entry area, look around.... to your right under the stair case is a wonderful closet area that also provides the access for a future stairs down to the optional unfinished 1,000 square foot room not included in the tax roll square footage. There is an exterior door to the rear of the home into a covered breezeway that is designed to be enclosed and the enclosure door is ready to be installed. This extra sunroom if you will, is not included in the square footage. There is a door to the attached 25' x 40' four car garage, and a third door into a closet area designed as a future dumb waiter or elevator with a matching closet/elevator space above on the main living level. On the entry level, totally removed from the main masters quarters is the spacious 2nd master suite 18'8" x 16', featuring a walk in closet, it's own covered deck with tile flooring, a ceiling fan and large lovely private bath. The bath vanity top is corian and the cast iron tub with shower is enclosed within corian walls. The large windows in this bath provide fresh air and a private secluded view into the avocado grove. The second spacious bedroom 14'7" x 15'10" has mirrored closet doors, a ceiling fan, an adjoining covered deck shared with the other bedroom and access to the luxurious guest bathroom off of the hall. The guest bath has a corian vanity top, ceramic tile floor, and a large walk in doorless corian walled shower. Seldom in any price range do you see such extensive use of the corian product, massive slabs of absolutely beautiful, seamless, waterproof, easy to care for luxury. Every bathroom cabinet in the home is solid cherrywood, not a piece of particle board will be found anywhere in this home. All of the baths and kitchen enjoy instant re-circulating hot water for pleasure, energy saving and most of all water savings. Now, up the sweeping stair case to the 25' x 40' GREAT room with three large picture windows to enjoy the panoramic views. All of the window sills throughout the home are matching wood sills. The great room features a "ready to party" granite wet bar with brass sink and leaded glass fronts on the cherrywood cabinets. the back of the bar is beveled edge mirrors. The incredible fireplace, rests massively in its own alcove 10' wide and recessed 3 1/2 feet so as not to break the lines of the room. Three ceiling fans adorn the ceiling of the great room and the brass chandelier lit dining area is ready for any size dinner party. Off of the main living level landing is a lovely powder room with a vanity top of solid Serpentine. This exquisite piece of Serpentine, left in the ground for another 1,000 years of heat and pressure would become a solid piece of jade...... it is beautiful. In the background is the KITCHEN.. the finest we have ever seen. The closet designed as a dumb waiter or elevator enters on this landing and the entry to the master suite is off of this landing. Ahead in the breakfast nook are sliding doors out to a covered viewing deck that wraps entirely around the North and West sides of the Kitchen and Nook area providing views of Mt. 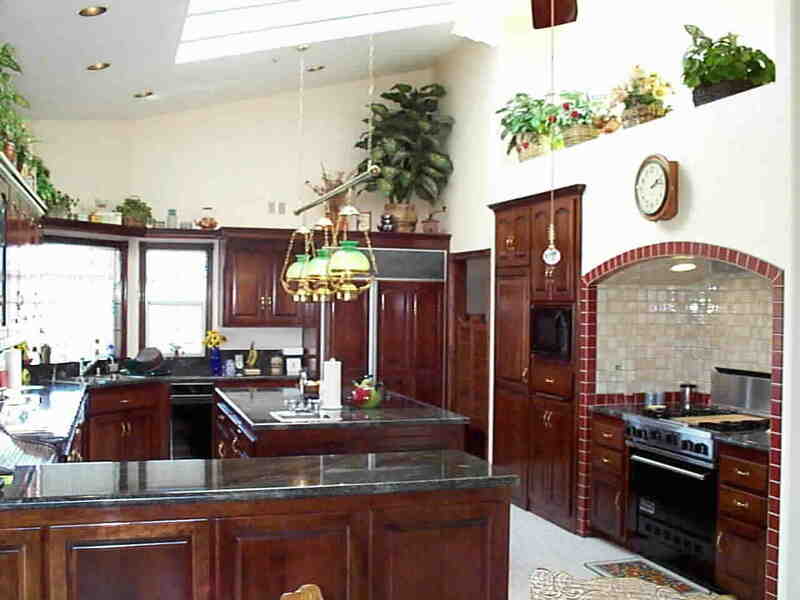 Palomar, the San Gabriels, and the cool Pacific Ocean and beautiful sunsets....but first you have to see THE Kitchen ! Wow. The center island is a slab of deep tropical green granite (that at first looks black.. but too elegant for black) measuring 6'9" x 4'4" and matching perfectly the additional 25+' of counter space. The kitchen cabinets, like all of the bath cabinets are solid cherry, not just the fronts, this is the quality that defines quality. Built into the kitchen cabinetry is a 15 bottle wine rack as well as a roll top desk to house the kitchen computer and random access to those recipes. Notice the commercial Viking gas range and oven in it's own alcove, vented and sprinkled. Built into the center island is an electric Amana Quartz Halogen range top.. probably the most expensive warming plate and staging area you'll ever see. This is truly a gourmet kitchen designed for a chef.. a micro convection oven, Sub-Zero refrigerator with two compressors, a large walk in pantry with thermostat protected cooling, vegetable sink in the center island, trash compactor, pull out drawers, removable cabinet doors, reverse osmosis water filtering, recessed lighting, oversized sink set to maximize the view, and all brightened by multiple skylights.